This web page provides a daily "earth science picture of the day". The page for Oct 16, 2010 features a stereo pair of a UK (Guildford) "sundog" atmospheric phenomenon as well as links to assorted optics and related physics topics. This is an interesting pair. Stereo photography usually gives a misleading impression for refractive/reflective phenomena like rainbows. The reason is that the rainbow forms along a circle whose position is fixed with respect to the sun, not the mist. As a result, when you move sideways to shoot the second photo, the rainbow moves with you and the sun instead of staying stuck to the mist. The result is that in the final pair, the rainbow appears to be at infinity (right out there with the sun), not within the mist where the refraction/reflection was actually happening. Sundogs do the same thing, so a stereo pair would normally put them firmly at infinity also. But in this pair, the sundog appears to be either way in front or attached to a background cloud, depending on whether you view the pair as crossed or parallel. So, when properly viewed, the sundog appears attached to the background cloud. Why is that? Well, even that appearance is misleading. Notice the relationship between the broad red band and the small white details of the dog. In the right view, the red band has moved obviously to the right compared to the bright details. What's happening is that the dog itself is an extended structure of brightness that varies slowly from bright white on the left to dim red on the right, while the cloud has small regions that vary strongly in their strength of reflection. As the brightness pattern of the dog slides across the cloud, the bright spots of the cloud remain at the cloud's position, while their brightness and color vary as the dog moves. Our stereo vision process pays attention to details and not to broad changes in brightness and color, so it latches onto the cloud to establish position. Meanwhile a different part of our head identifies the bright area as a sundog. 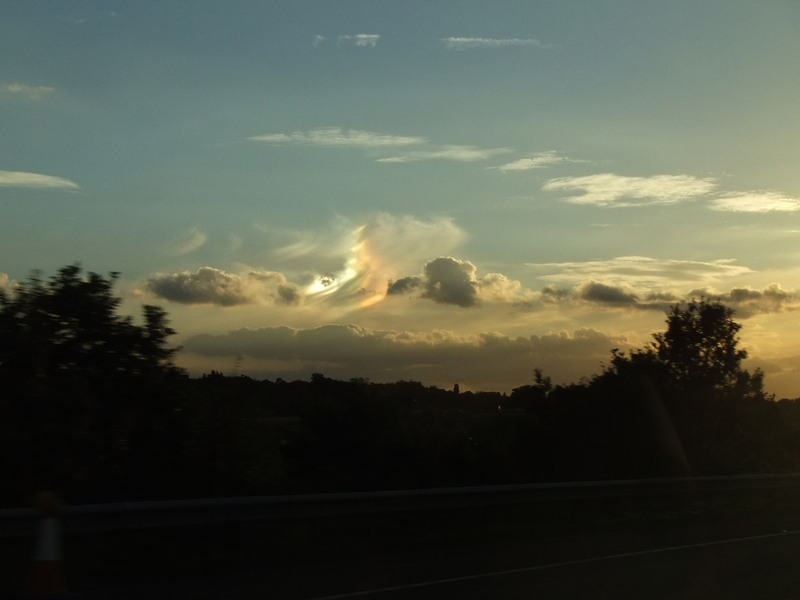 When the two pieces of info come together, voila -- the sundog appears attached to the cloud. It's a very nice illusion. I notice that the web pages make a point of asking, "Can you see the 3-D effect?" Noting that this pair is reversed from the usual convention, I'm far from confident that the effect they're talking about is the one that corresponds to reality! Quite frankly, I suspect they accidentally reversed the pair and may be expecting people to see the dog distinctly in the foreground, exactly the reverse of the actual situation. Thanks for the discussion and analysis. I wondered if there would be any effects from the 20-second delay between the individual photos of this pair? Setting aside pixel peeping observations, my superficial thoughts are that the mist isn't varying much at the large scale. Nevertheless, I am still uneasy that one could always expect to have an extended period of time, measured in the tens of seconds ore more, within which to take a pair of stereo images of this event. Also, if I'm interpreting the scene correctly (hardly guaranteed), isn't the sundog itself positioned quite some distance from the photographer, thus making stereo 3D visualizations and effects unlikely? Is it possible that the photographer therefore must have positioned his/her camera so as to artificially create a 3D stereo effect? I'm just wondering if the camera was moved between shots much more than the distance between human eyes, etc. As I look about 1.5 miles across Casco Bay from my living room window at my home in Maine, the treeline at the opposite shore's edge looks very flat with little depth, especially where the lighting is flat and unshadowed. Wouldn't the same lack of depth occur with this sundog? I suspect I'm just missing something here (not exactly a new phenomenon!). In any event, it's an interesting web page and photos. Is it possible that the photographer therefore must have positioned his/her camera so as to artificially create a 3D stereo effect? Absolutely. In fact I'd say not just possible, but required. At the bottom of the page at http://epod.usra.edu/, there is a link titled "Another photo of this sundog". That points to http://epod.usra.edu/library/101610_sundog.jpg. If you go there, you'll see a much wider angle picture that shows context. What shows in the wider angle picture appears identical to the clouds in the left side of the stereo pair. When I saw just the pair, I thought they were probably shot from a plane, but this second photo makes clear that they were shot from the ground, probably on a road, maybe even from a car. So, 20 seconds is plenty of time to take one picture, then move to a new point even some hundreds of feet away and take another picture. Having such a long baseline extends the stereo effect to much longer distances. It's the same trick that I used HERE to get good stereo on those crags across the valley. I wondered if there would be any effects from the 20-second delay between the individual photos of this pair? That's certainly possible too. If the winds were blowing quickly, then clouds in the foreground would appear to move relative to clouds in the background. On the other hand, if all the clouds were really moving sideways and at the same speed, then the resulting relative shifts would be just the same as changing viewpoint. Where things could get really scrambled would be if different clouds were moving at different speeds, in which case the different relative movements would change the apparent depth. We can't tell whether that happened here or not. I did check for differences in cloud shape that could be caused for example by shearing winds, and I didn't find any. Definitely. In the left image of the stereo pair, look at the left bright spot of the dog -- the one with dark spots in it. Comparing against the right image, you can see that those "dark spots" were actually caused by a smaller dense cloud in the foreground, which in the right photo has moved left so as to no longer obscure the dog. Then taking a look at the wider context shot, you can see that all these clouds are quite some distance away. Even the foreground dark clouds are probably some thousands of feet away, and the cloud layer causing the dog is much higher and behind that. We need to be a little careful about those words "mist" and "large scale". Liquid water forms rainbows at 40-42 degrees away from the sun. As noted on the page with the stereo pair, what forms sundogs at 22 degrees away from the sun are "plate-shaped ice crystals having a preferred orientation". I believe you'll only find those at high altitudes in quiet conditions that allow such crystals to arrange stably in a single orientation. (See http://en.wikipedia.org/wiki/Sun_dog for more explanation.) So I think the clouds that are actually forming the sundog here are those thin wispy guys way in the background, at such a long distance that even the "fine details" are hundreds of feet across.